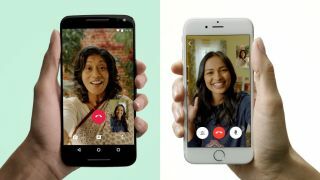 Afters months in the beta stage, WhatsApp's video calling feature is now rolling out around the world to the app's one billion users, as the messaging client takes on the likes of Skype, FaceTime and Google Duo. Video calling should be available in a WhatsApp update for you now or in the next few days – we still can’t download it here in the UK, but many are reporting the update in the US. The new WhatsApp feature is a cross-platform video calling service, so you’ll be able to see and speak to friends who use iOS, Android and Windows Phone. WhatsApp is playing catch-up with its video calling feature, as rivals have provided the service for quite some time now. That sounds like a bit of a dig at Apple’s Facetime, which you’ll only find on Apple products, and means you're restricted in the amount of people you’re able to talk to. Skype, Line, Viber and others have provided cross-platform video calling in the past, but having the feature ready to use in an app downloaded by over a billion users may mean you'll soon get a lot more video call requests.